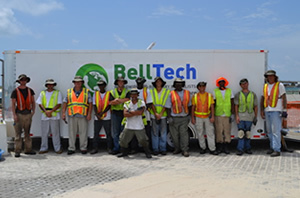 Company | Bell Tech Inc. Experience ranging from the Exxon Valdez to the Deepwater Horizon Incidents, Bell Tech has cleaned more contaminated vessels than anyone in the world. A snapshot of our current projects and a long history of performance all over the world. Bell Tech works with these leading organizations to research, develop and test cutting edge technology and processes. View Bell Tech as the featured article in Eco Magazine. Get in touch with a Bell Tech representative. © 2018 Bell Tech Inc.. All Rights Reserved.